Welcome to the homepage of The Dahlia Lady of Springfield! 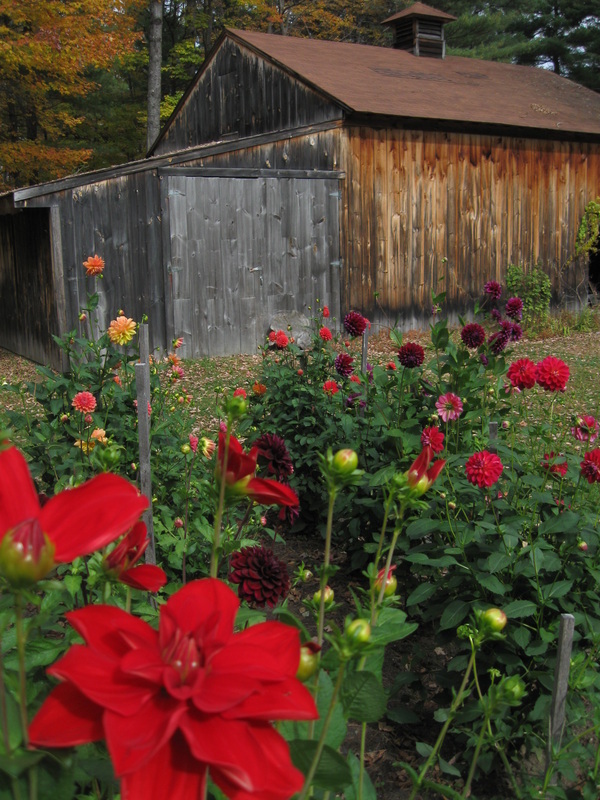 Check out the article on the farm and growing dahlias in Springfield in the Kearsarge Magazine Fall 2013! On a statewide level, the farm was featured in New Hampshire Home magazine on page 98 in the September-October issue 2016. If you would like to learn to grow dahlias with similar success, check out my Growing Instructions page, or visit the Contact Info section for where and when I will be giving my next dahlia talk. For a selection of the plumpest, healthiest, hardiest tubers around, but only offered at the farm and Farmer's Market!!! check out Tubers Available. Last, but certainly not least, peruse my Cut Flower Varieties to see what's available for take-home in the fall. 2019 marks my 20th year of growing dahlias. For most growers, last year was a tough year for growing dahlias. For By Design Dahlias, it was an excellent test of the resiliency of this farm plan. The dry garden thrived in a spring that was too wet, and the swampy garden did it's part in the summer droughts. Thousands of tubers went into storage, and if the overwinter storage continues along it's trend of getting better each year, that means thousands will come out of storage ready to burst out of the ground! I've been adding interesting new varieties each year, and I'm extremely pleased with the selection I now have to offer YOUR garden! I sell tubers at the Norwich Farmer's Market in late May, typically. I will have tubers before then, starting around the 1st or 2nd week of May so you'll just may want to come out to the farm if you can't wait. If you come too early, though, I warn you, I will set you to task pulling tubers out of garbage bags and sorting them. It's an onerous job. Every year, I get requests for tubers to be shipped. I love that you far away folk want my beauties, but I still haven't found a shipping department, and I have my hands full with selling from the farm. I will keep trolling for someone in the Kearsarge area who wants to make some money with online sales, and boxing and shipping tubers... but until that individual is found, I'm afraid you are going to have to ROAD TRIP!!! And new as of 2018! The Hanover and Lebanon Co-ops! Currently, I do not offer online or by mail sales of tubers or cut flowers. I have neither the time, nor staff (it's just me) for web sales and shipping. Perhaps someday when I have more time to devote to the business, I will reach out nationwide. At this point I can provide you with information regarding location of the farm or nursery, a sampling of the cut flowers and tubers available, some info on growing these wonderful flowers and what farmer's markets I will be selling at! Website update is not my first priority, so please check back later if you don't find what you are looking for now! And use the contact information to let me know what you think! BY DESIGN DAHLIAS: I started selling flowers at the Norwich Farmer's Market back in 1999. I gave the company a name in 2001, and I've been providing outstanding cut flowers and quality dahlia tubers ever since. My arrangements are known for their vibrant colors, my service is appreciated because the customer makes all the choices, and my tubers are big and firm and produce amazingly healthy dahlia plants and flowers. Dahlia cut flowers if kept in clean water look lovely for 7-8 days or more. They make fabulous gifts, and their colors really do sooth the soul. Try a bouquet and see for yourself! Go to our "Contact Info" page to find out what Farmer's Market I will be at next and when!